This technical note explains how to use the LatticeAx™ to accurately target and cleave structures printed on <100> silicon1 and rotated 45 degrees relative to the notch or flat. 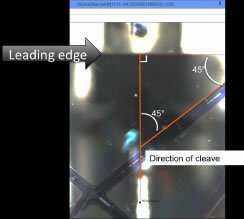 The methodology used to cleave a sample with lithography printed at an angle is identical to that described in the LatticeAx™ manual, LatticeAx™ Operation Instructions V08052013. 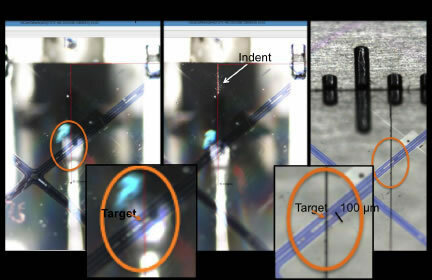 For the best targeting accuracy, the sample must have a clean leading edge. If the leading edge is not straight or is too rough, the target will be missed unless it is very close to the indent. 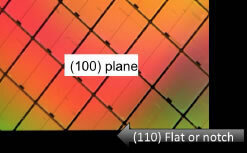 For all <100> silicon, the direction of the cleave will always be 90 degrees to the leading edge shown in Figure 3. This property allows the direction of the cleave and location to be defined by drawing a line perpendicular to the leading edge (see Figure 3). Figure 4A shows the targeted feature (≈25-µm) circled in orange with the red line defining the direction of the cleave. Position the diamond indenter over the sample and align it to the red line by using the indenter positioning knob. Turn the indenter knob just enough to make a shallow indent on the sample surface. The resulting indent will be perpendicular to the leading edge of the sample and over the drawn line (Figure 4B). Perform a cleave on a test sample to verify that the indent is perpendicular to the leading edge. If the indent appears to be at an angle, this indicates that the leading edge should be improved. Cleave the sample using the instructions in the LatticeAx™ manual. This results in a cleave through the target as shown in Figure 4C. Note: It is not possible to cleave perpendicular to the pattern using this method. 1Wafers are grown from crystal having a regular crystal structure. When cut into wafers, the surface is aligned in one of several relative directions known as crystal orientations. Orientation is defined by the Miller index, like <100>.